Conversations about church jewelry art. 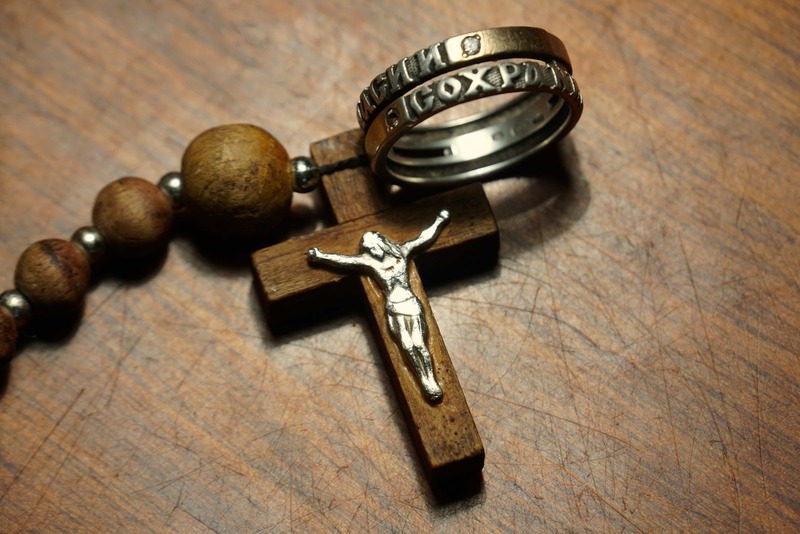 Today, as the demand for ecclesiastical jewelry grows, many secular jewelry enterprises endeavor to manufacture such items, while jewelry stores offer them for sale. Unfortunately, few people pause to think about what church art actually is, or which qualities it should possess to deserve to be called such. Therefore, before we turn to the more specialized subjects, let us try to answer these general questions first. One must note straight away that not every work of art with a religious theme should be regarded as church (ecclesiastical) art. If we define ecclesiastical art as the art that has arisen formally within the church or for the needs of the church, where the church is understood as a temple or an organization, the definition will be inaccurate. To avoid framing the question in a layperson’s terms, one should turn to the apostolic definition of the Church as a Divine living organism or the “Body of Christ”(Eph. 1:23) rather than an organization. In that case, church art will be both the fruit of the Church and, at the same time, its part, which, owing to the principle of catholicity, is just as complete as the whole. Otherwise, the connection would simply be impossible to make. And, since the Church is “a pillar and ground of the truth” (1 Tim. 3:15), this is precisely what ecclesiastical art is meant to accomplish: to reveal the Divine Truth, the one and only. After all, “Orthodoxy is not proven but shown”. To be able to achieve this goal, church art must possess three interrelated qualities: sanctity, traditionality and canonicity. Art is referred to as sacred (holy) when it reflects the spiritual vision of a confession using the internal symbolic language developed by the latter. Shape, color and visual images alike may be used as symbols, as may natural materials, which is particularly relevant for the art of jewelry-making. The symbolic language of the Church has evolved over millennia and was passed down from one generation to the next, therefore church art is traditional by definition. This, in turn, enables one to utilize the creative potential accumulated by numerous generations. Artistic tradition is an ever-evolving external form which allows one to preserve the spiritual content of the confession without any distortion. Due to the ethnic and cultural distinctions between different peoples, there is a great diversity of traditions in the Orthodox Church. At the same time, although these traditions are characterized by dissimilar forms, they are united within the same Church and are Orthodox if their existence and development are governed by the Orthodox canon. What exactly is the Orthodox canon? Today this concept in ecclesiastical art is muddled and often distorted. Canon is frequently confused either with style or with tradition. One can see inscriptions such as “Executed according to the canon of the Orthodox Church” on exhibition stands featuring religious-themed artwork, which immediately speaks of the items’ non-ecclesiastical nature. The Orthodox canon cannot be given any concrete formal definition, just as it is impossible to determine Who or What is God by intellectual means alone. First and foremost, canon is life in God and creative cooperation with God. Canon is never revealed in full; it is bestowed by the Holy Spirit, living and bearing fruit in the Church as the mystical Body of Christ. Canon is not the result of human reasoning, it is absolutely objective and cannot described in terms of external characteristics. The canonicity of a work of art is determined by the degree to which it possesses Divine beauty. This is the very purpose of ecclesiastical art: to be the creative comprehension of canon as God’s Beauty. According to Father Pavel Florensky, “beauty excites love, while love grants knowledge of the truth”. All of the above does not render te regulations and recommendations existing within the Church with regard to ecclesiastical art any less necessary or useful. However, they are merely a material basis, akin to a skeleton that is fleshed out in the presence of a spiritual life, but withers, dries out and crumbles into fragments of dead bone in its absence. Since the tasks and distinctive features of church art are both spiritual in nature, the evaluation of artwork may pose a problem. There is a constant temptation to use worldly criteria for the assessment, as those are more specific and clearly defined, which leads to the increasing secularization of church art. This process has already been taking place in Russia for three centuries with varying degrees of success. In spite of oneself, one cannot help asking: how is one to determine whether a particular work of art possesses the qualities described above? The answer is simple, yet extremely hard to apply in practice. In order to notice the sacred, the traditional and the canonical, we these qualities must be inherent in ourselves. This means that, to be able to tell what is or is not sacred, one must have a religious consciousness; to determine what is traditional, as far as Orthodox Christianity is concerned, one must live within the Orthodox tradition, study it and contribute to its development; finally, to tell what does or does not meet the canonical requirements, one has to participate in Church life on a regular basis, possess some theological knowledge, and, most importantly, engage in spiritual practice. It is virtually impossible to have these qualities to the utmost extent. Therefore, for a start, it is important to at least believe in their existence, then find them in oneself and strive to develop them further. Afterwards, as the saying goes, the Lord shall take care of the rest. One Response to “Conversations about church jewelry art. Very well described. IC XC Nika! Orthodoxy is lived, revealed and perceived. Symbols guide us to faith. Holy Icons reveal the True Faith.